WOW, spent the last two days running around shopping, and I'm POOPED! Half the problem is I don't know what to buy anyone! Does everyone already have too much "stuff"? And, does everything seem to cost twice as much as it did last year? And I like Christmas and all that goes with it, but it is discouraging out there. Want to finish up shopping and wrapping so I can concentrate on getting my house decorated and cookies baked. 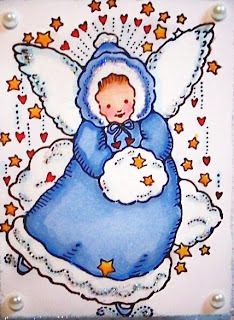 Today's card is for the challenge at Penny Black and Friends Saturday # 180, Total White-Out! Only the image can be colored, everything else on the card must be white. All White card stock, run through embossing folders, snowflake and star. Sponged the edges of the layers ever so lightly with light blue ink. Those pearls are beautiful on the card. I love the white on white cards. Yes, everything is much more expensive this year. I expect to see more sales closer to Christmas. I think everyone has stopped buying after the big rush on Black Friday. 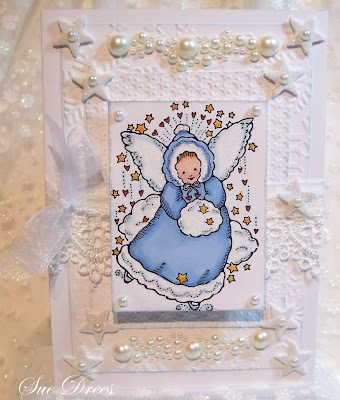 Gorgeous card, love the sweet PB image you've chosen.